Many have other claims to fame, such as the web series The Variants, the web comics The Rack, She Died in Terrebonne and The Loneliest Astronauts, the podcasts People You Don’t Know and War Rocket Ajax, the scholarly work May Sinclair: Moving Towards the Modern, the Action Age comic imprint, and the comedy Web site The International Society of Supervillains. The Bureau Chiefs are not looking for submissions. Eugene Ahn is a recording and performing musician, and creates nerdcore and geek-themed hip hop under the alias Adam WarRock. He is the Internet’s foremost comic book nerdcore rapper. He also lectures and works with multiethnic organizations in advising students on transitioning from professional to creative careers and career paths. He was formerly a practicing attorney and political worker, but now mainly focuses on disappointing his parents. Benjamin Birdie is a writer, cartoonist, and graphic designer living in Queens, New York. He draws The Rack, known worldwide as America’s preeminent comic strip about a comic shop. David Campbell hails from sunny Seattle, where he works as a web producer for game developer ArenaNet (creators of the upcoming Guild Wars 2) by day and as a freelance writer by night. Dave has worked for a variety of big-shot clients like Microsoft, ABC TV, and your mom. Mark Hale of Louisville, KY, is a lapsed comic blogger, an infrequent Twitterer, and co-creator of the Fake AP Stylebook. He is a student of journalism but currently grinds away as a low cog in the corporate totem pole. When he’s not mixing metaphors he enjoys bitching with his friends on the internet and lounging around with his wife and pets. Josh Krach is a freelance writer and designer who lives in Alabama with his wife, child, and a truckload of white liberal guilt. He letters the webcomics AWESOME HOSPITAL and MONSTER PLUS. Dr. Andrew J. Kunka, Ph.D. is a tenured associate professor of English at the University of South Carolina Sumter, where he has an undue influence on the impressionable minds of America’s youth. He co-edited, with Michele K. Troy, the scholarly essay collection May Sinclair: Moving Towards the Modern (Ashgate, 2006), and he has published on First World War literature, war movies, and comic books. He blogs about comics and movies as Dr. K at the 100-Page Super-Spectacular. Dave Lartigue blogs about boardgames, comics, Lego, and other nerdly passions at Dave Ex Machina. He lives in Springfield, Massachusetts with his lovely wife. Ken Lowery is a native Texan, but don’t hold that against him. He is a freelance movie critic and co-creator of Fake AP Stylebook on Twitter. He is also co-creator, co-executive producer, and co-writer of the acclaimed Web series The Variants, a comedy about retail life in a comic book shop. You can find him on Twitter if that’s your thing. Anna Neatrour is a librarian. She lives in Utah with her husband and twin toddlers. She blogs at TangognaT, reviews manga on Manga Report, and runs Manga Views. Chris Sims is the Senior Writer and resident Batmanolgoist of the Eisner Award-nominated ComicsAlliance.com and the co-writer of Awesome Hospital and other fine comics. In other words, his actual job is to sit around making things up and getting paid for it, and all things considered, that’s pretty sweet. His favorite color is blue. Mike Sterling sells funnybooks for a living, writes about them in his free time, and complains about them on Twitter. He also collects terrible comments people leave on online news stories. Sometimes, he sleeps. He hails from Oxnard, CA, because somebody has to. Andrew Otis Weiss is a native of Woburn, Massachusetts, where he lives with his roller derby queen wife and a house full of pets. When he isn’t at his day job at a public university, he spends his time searching for Comicpunx material, playing videogames, and thinking about nuclear war a whole lot. RJ White lives in Philadelphia, where he works for a quasi-governmental municipal authority. His work has appeared on various websites and in a couple of books. He hosts the Wasted Words podcast, makes Fake Criterions, edits The City Desk and occasionally writes for other sites. Matt Wilson was a government and politics reporter at the Chattanooga Times Free Press for almost four years of constantly turning down free food. He now lives in Chicago, where he’s a reporter for a communications trade website. He’s been writing Internet comedy pieces for a long time, and a few people have even read them. Matt co-hosts the War Rocket Ajax podcast and manages the Fake e-Etiquette Twitter account. Dorian Wright – Dorian has been blogging about movies, comic books and barely clothed men for over five years. He lives in a hoity-toity part of California. John DiBello has been working in publishing since the days of those stone newspapers in The Flintstones. He lives in Brooklyn, New York with his fianceé Randi, plus several semi-imaginary friends including Bully the Little Stuffed Bull, who writes the blog Comics Oughta Be Fun! He has never met Michael Caine. Kevin Church writes and publishes Agreeable Comics, promotes himself on BeaucoupKevin.com and has the obligatory Tumblr that you can follow at Disco Potential. He is also on Twitter and Facebook. 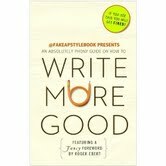 Pingback: I helped write a book, and I would like you to buy it.